Home Engineering JEE Main How to prepare for JEE Main without Coaching? How to prepare for JEE Main without Coaching? 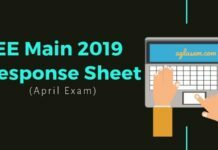 How to prepare for JEE Mains 2019 / 2020 from Class 11 / Class 12 in 1 Year or Two Year? All India Rank 1 in JEE Main, Kalpit Veerwal got 360 out of 360. His advice to students preparing for JEE Main 2019 or JEE Main 2020 is to start enjoying studies and take it as a learning experience. Scheme of examination describes what type of questions would be there and their numbers. It helps to prepare for the exam when exam pattern is known. You can solve sample papers of JEE Main to train in answering questions of that pattern. Build speed skills to solve that the number of questions in a row in given time. Paper 1 and Paper 2 have separate paper patterns. Also, to improve accuracy, know mistakes you usually mistake. Next time you attempt a similar question, avoid making that mistake. For mathematics, he says that practice is key. Study theory of mathematics topic then solve a few questions on it. To manage time for JEE preparation, utilize free time for preparation. Finally, revision is important to score high in JEE Main. One question that students have is about books they must study from, for JEE preparation. It is important to study from NCERT to understand theory and clear basics. After studying a topic, solve MCQs on them from books that have MCQs. For mathematics you can go for Arihant Skills in mathematics, A Das Gupta; for Physics you can refer HC Verma, and Irodov; for Chemistry use Paula Bruice, Solomons, JD Lee, Bruce Mahan, Vogel, Peter Sykes, Olympiad papers. If you have study material from a coaching center you can solve questions from there also. It is advisable to solve previous year IIT JEE question papers also to prepare for Joint Entrance Examination. Level of studies in class 11 is a huge jump from what you studied in class 10. Syllabus seems tough and pressure to excel in JEE adds up. Being stress free is important, where time management plays a role. Try solving a tough book after doing a basic one. Make a study plan and adhere to it to boost confidence. Discuss roadblocks of topics with teachers and mentors. If you are doing self study, then study from JEE Main syllabus alongside school studies. 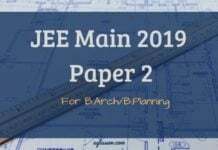 Recommended: Most Important Chapters For JEE Main 2019. If weak in class 11 topics and JEE is near, then first thing to do is to revise class 11. Study some topics of class 11 alongwith class 12, do not sacrifice one for other. Allocate few hours in study plan daily to prepare class 11 topics, rest do for class 12. There are some units in class 12 which require good understanding of some unit of class 11. When you come across such topics, revise class 11 unit first. Students mentally divide themselves among coaching and non-coaching. Experts have said that there is no difference between them; you can do as well with or without coaching, subject to being focused. Study well in school and pay attention there. After coming home, do homework and revise topics. Side by side solve JEE questions on same topic. Refer good books to bridge gap between board studies and JEE. 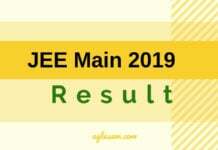 Speed and accuracy are important for JEE Main 2019 preparation. To build speed, solve questions in time limit. To build accuracy check answers and eliminate mistakes, build reading and comprehension speed, be careful in selecting answers. Have your own paper solving plan. You may want to first attempt one liner questions, and then go for calculations; or other way round. How to prepare for JEE Main with almost 1 year in hand? With the changes in examination pattern of Joint Entrance Examination, it has become as important to study for your board exams as for engineering entrance exams. Instead of considering only marks scored in the JEE, marks of board exams are also considered under the new normalization rule, the plan needs to be changed when it comes to JEE preparation. The exam is held in the Online Mode only. In the JEE Main online exam, each student is assigned a computer in the test center. When the test begins, the questions appear as multiple choice questions. After reading and solving the question, the correct bubble against the answer has to be selected and then the student can click on “Next” button to to move on to the next question. If a student is not familiar with online exams, it will not be very difficult. The student should only know how to click using a mouse and not have difficulty reading on screen questions. Teachers, parents and many other might have already told you to study from NCERT books. However, we advise you to be absolutely thorough with each and every topic and sub topic given in Class 11 NCERT Books and Class 12 NCERT Books of Physics, Chemistry and Mathematics. Not only should the theory be understood properly, but each question should be attempted at least once. Especially in the case of JEE Main Mathematics, a student who can easily solve NCERT Math book miscellaneous exercises can as easily score more than 90% in JEE Main maths. There are too many books available in the market that claim “Quick course in JEE” or “Best book for JEE Main” and so on. You must identify one – two books only and stick to them. Using too many books will only confuse you and slow down your preparation. Use one book for theory, one for practice. It is best to refer book by a good author/authors to study and understand concept, and use another book to solve practice problems for JEE Main. Always practice questions simultaneously. While studying, you may think you have understood everything perfectly, but only when you attempt questions can you actually analyze where your understanding is weak and needs to be done again. If you finish one chapter, the next day attempt at least 20-30 questions of that. If you can answer correctly at least 95% of all the questions you attempt, you can move on to the next chapter. If not, focus on the areas you are getting wrong. Every student has at least 5-10 topics he / she feels are very tough and cannot be done at all. Remember, it is as important to study those areas as it is do the others. You can never be sure whether a question in JEE Main will come from that topic or not. 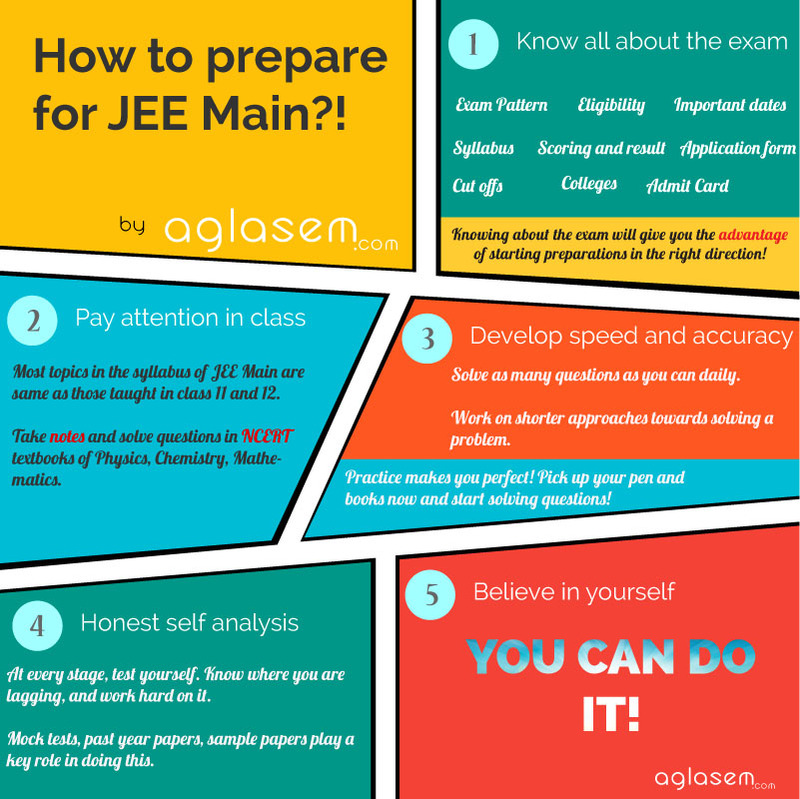 JEE Main Preparation Tips to study for Class 11 and 12 Students. After you have studied all the topics relevant to class 11, make a list of topics you are weak in. Before class 12 classes begin, revise them thoroughly and master them! If you keep them for the end, just before the exam, it will be difficult for you to study them. Maintain notes of important topics. This is very important because a few weeks before the exam, you will want to go through each chapter, but time will be limited. At such time, your notes will come in handy. You can refer to important formulae, short cut methods and other things that will help you in the exam. Do not procrastinate! Each day is important when it comes to cracking important engineering entrance exams. You need to give it your best shot. Time management is very important. Make sure you divide your time well between school, tuition/coaching classes (if any), exercise and entertainment. For class 12 students, it has to be kept in mind that you have to score high in board exams also. Thus, do not take your school exams lightly as the sessional assessments may reflect what you will actually score in the final exam. 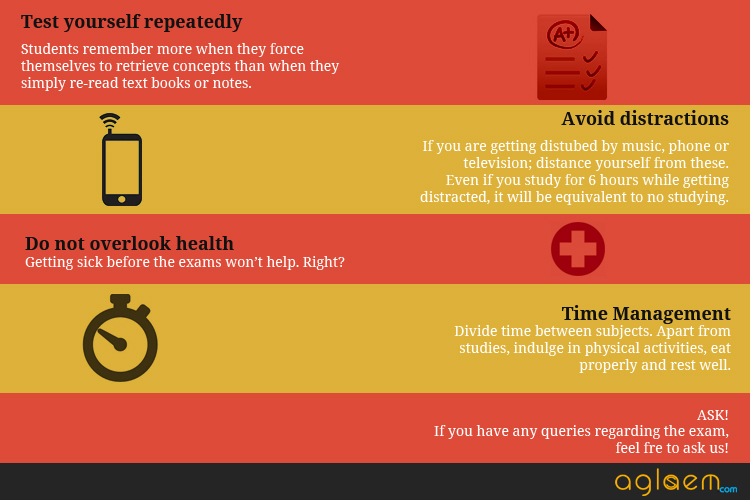 While studying, make sure there are no distractions like phone, television or other things. After each chapter, solve a wide range of questions. If you cannot study for long hours, take constructive breaks. Like going outside to play; physical activity also helps in keeping you fit and give a restful sleep. Do not stress yourself. If you are getting nervous while studying, take a deep breath and remind yourself that Everything is possible! If there are difficult chapters or topics, ask a teacher to explain it to you. Then study again and practice questions. Take JEE Main mock tests. And most important – Do not give up!